Make sure that the main power connector is connected to the motherboard. Energizing a power supply without a load can instantly destroy it. Check all the fans to make sure they are properly connected. Starting up your computer with the CPU fan disconnected will result in your processor being irreparably damaged with minutes or seconds. The same goes for the chipset fan, if present. Make sure that all wires and cables are safely tied away from the fans and from sharp edges of the case. Neatness counts. Use plastic cable ties, not metal twist-ties. If you can't get plastic cable ties, then use electrical tape. Check that all of the power and data cables are properly and securely connected. Make sure that there are no tools, screws, or jumpers floating around in the case. Check that all expansion cards and RAM modules are securely seated. Make sure that the voltage setting on the power supply is the correct one for your region. 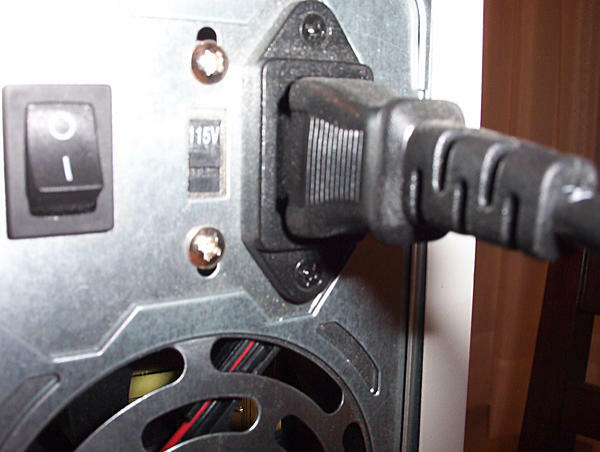 Most computer power supplies have two input voltage settings, usually taking the form of a small slider switch. Make sure that this switch is set to the correct voltage for your part of the world before you plug the computer into a power source. Computers and other delicate electronic devices should always be plugged into, at a minimum, a surge protector. An uninterruptible power supply is even better. In the United States, the correct power setting will be 110 - 120 volts. In your part of the world... Well, I really have no idea. Ask someone local if you are unsure about it. Once you're sure your power supply is set to the correct voltage for your region, plug the power cord into the power supply and the other end into your surge protector or uninterruptible power supply. Hook up the keyboard, monitor, and mouse to their appropriate connectors if you haven't already, and press the power button. If you have done everything correctly, after a few seconds you will hear a delightful beep as the computer passes its very first POST (Power-On-Self-Test), and you should be greeted by a screen that looks vaguely like the one in this picture. This is called the CMOS Setup Screen or BIOS Setup Screen. You may have to press DELETE, F2, F10, or some other key to get to the Setup screen, depending on your motherboard. Consult the manual if you're unsure. Because your computer has no operating system at this point, you'll probably get an error message that says, appropriately enough, something along the lines of "No operating system found," maybe with some aural alarms just for good measure. That's nothing to worry about because your computer, in fact, does not have an operating system yet. So consider it an observation, not an error. If you see something that looks like the picture shown here, then pat yourself on the back. And exhale. Your homebuilt computer is alive! 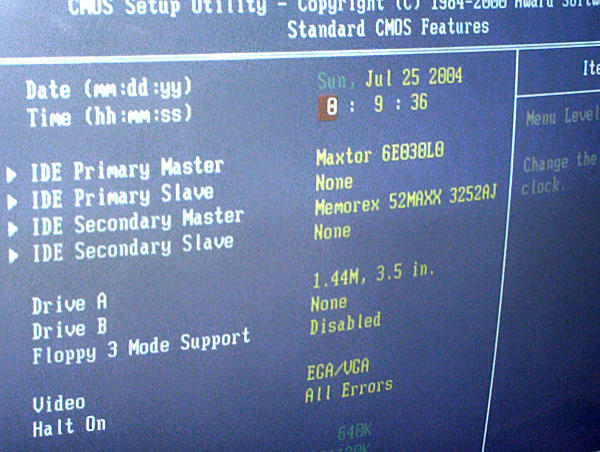 The CMOS Setup Screen (or BIOS Setup Screen) is where you set all the low-level settings that your computer needs to be capable of, well, being a computer. This is all your computer is capable of doing until you install an operating system on it, and the settings you select will affect the way your OS performs. Most computers come with CMOS settings designed for Windows and to be good settings for the majority of people using that operating system, so you may not need to do anything at all except set the hardware clock. The settings the computer comes with are called the "default" settings, and they're suitable for most users. Start with the default settings. You can tweak them later if you like. Just check to make sure that the time and date are correct. You can use local time or Coordinated Universal Time (Greenwich time). Most Windows machines use local time, and most Unix and Linux machines use Greenwich time; but either system will work either way. If you don't know what a setting means, leave it alone. Don't change any settings unless you know what you are doing. Make sure that all of your drives are showing up. If not, look to see if the drive controller is disabled in BIOS. If the drive controllers are enabled but the computer doesn't see the drives, shut down the machine, unplug it, and re-check all your drive connections (and jumper settings, if using PATA drives). Before installing your operating system, make sure that the optical drive or USB drive, depending on how you're going to install your operating system, is set as a bootable device. That's usually found in a section of the CMOS called "Boot Settings" or "Boot Sequence". Some things just make sense. Make sure the date and time (and time zone or UTC offset, if those settings exist) are correct before installing the OS. Incorrect dates and times can cause all sorts of problems. Once you've finished CMOS setup, saved the settings, and rebooted, you're ready to reboot into the boot media and install the operating system. Stay calm. And don't cry. Unless you're a little kid. Then you can cry if you want. If absolutely nothing happens when you push the power button, then chances are that the power supply isn't connected, the voltage switch is in the wrong position, or there is a toggle switch on the back of the power supply that is in the off position. If the LED's light up and the fans start turning, but nothing else happens, then most likely either the processor or the video card is not properly seated. Power down, unplug, reseat both parts, and try again. If the computer begins to fire up, but then emits a shrill alarm, power down the computer and re-seat the RAM modules and all the peripheral cards. One of them probably isn't seated firmly. If that doesn't work, check the motherboard manual to find out what the alarm means. Different combinations of beeps mean different things, but the codes are different on different motherboards, just to keep us geeks on our toes. Sometimes, two expansion cards sharing the same resources can prevent a computer from booting. If everything else checks out, shut down, unplug, and remove all of the expansion cards except the video card. Then boot up again. If it works, shut down and unplug again and re-install the cards one-by-one, starting and testing the machine after each card is installed to identify the problem card. Sometimes just moving a card from one slot to another will make it work. Most motherboard manuals include helpful diagnostic and troubleshooting information. Consult the manual before you get depressed. Most problems are simple ones that can be easily corrected. If you're stumped, call the motherboard's support phone number or check their Web site for chat support. I hope you've enjoyed building your own computer. Now that your computer's finished, don't for forget to protect your machine from viruses and hackers and decide on a backup strategy. In fact, I suggest you download and install antivirus software right now, before you do anything else. If you would like to see your computer-building experience documented on this site, please send an email to .